A few months ago I shared with you a late summer visual + sparkle inspired by a fabulous Arts & Crafts house. I've also given you many sneak peaks of the final invitation, but I thought I'd stretch it out a little longer and show you the back side of the invitation with the custom pattern and logo used throughout the Wedding Invitation Suite. This fabulous couple gets married tomorrow, so I wanted to take a little moment to wish them the best on this new journey together. May your special day be filled with many great memories celebrating with family and friends. I hope to soon be designing your baby announcements! =) Congratulations. 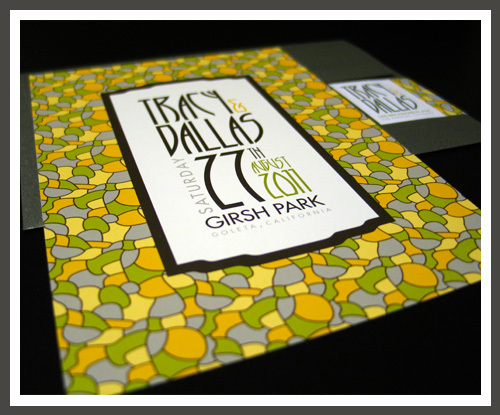 I'll be back next week with the complete Arts & Crafts-inspired Wedding Invitation Suite.